It's kind of sad that my kids have so many allergies when they love to be outdoors so much. We thrive hiking, collecting wildflowers, and hunting for mushrooms in the spring. However, it was around this time last year that Cort, not even two, had such a severe allergic reaction that we were referred to a pediatric allergist. The past year has been rough for him, with constant flareups of eczema and asthma, not to mention all the ear infections (I've lost track now - I think we've had 6 since November). But Reid and Pierce have also had their allergy flareups - I had to take Pierce in recently for a rather strange rash on his face. Even the doctor didn't know what to think. And Reid has had the more typical stuffy nose and sneezing. So I think this year we're going to try to relieve these seasonal allergies with Claritin. I like that it provides 24 hour non-drowsy allergy relief with just one pill a day. The less often I have to give my boys medications, the better I feel. And Children's Claritin is the #1 pediatrician recommended non-drowsy allergy brand. I was fortunate enough to be chosen as part of the Claritin's Mom Crew, and they sent me some products for the boys. I let Reid try Claritin first, as he has had a itchy, runny nose for several days and has been complaining about it. He had one of the grape chewable pills. He loved the grape flavor. When I checked in with him later during the day, he seemed to be doing much better - his nose had dried up. I was pleased that there were no side effects for him - he wasn't drowsy, nor was he bouncing off the walls. I think that this will be a good option for the boys until the pollen count drops off in mid summer. I hope that taking Claritin daily during peak pollen counts can also help keep Cort from having the sort of scary bad reaction that he had last spring. It's tough watching him struggle with so many allergy issues at such a young age. As part of the Claritin Mom Crew, I was sent several samples of both adult and children's Claritin to share with friends. Of course my blogging buddies are my friends too, so if you're interested in receiving a sample, let me know in a comment. I'll randomly pick 3 of you to send samples. 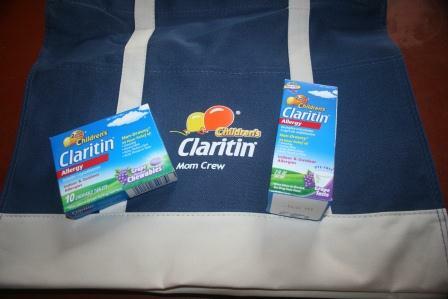 Disclaimer: As a member of the Children's Claritin Mom Crew, I receive product samples and promotional items to share and use as I see fit. No monetary compensation has taken place and any opinions expressed by me are honest and reflect my actual experience. I took Claritin every day for a number of years when I lived in dusty Arizona and it worked very well for me. My doctor finally weened me off of it because he said that otherwise it may not work for me when I need it to. Here in Virginia I generally only take it in the spring months of the year when pollen is VERY high. My husband now uses it almost year round. It's a great product and glad to hear it's working for your boys too! That's a great pic of Reid and Cort. Allergies are so confusing. At least the medical community does not see allergy meds as the pariah like they do antibiotics. 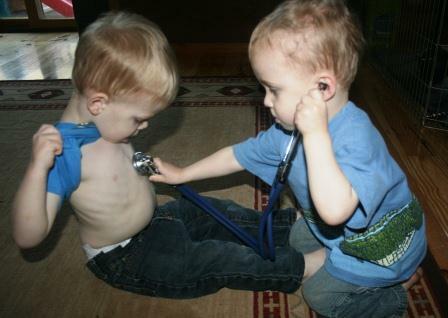 adorable pic of the twins, and sorry to hear of the allergies and ear infections... the m.d. advice to me has always been to start the pills two weeks before things begin to bloom, so I have to watch the weather forecasts, etc. If I do this, then I get by with only a half pill (zyrtec for me) every other night for the next 3 weeks and then half a pill twice a week for two weeks and I'm done. Oh I do hope this works for your boys. It would be such a relief for all of you, I'm sure. The picture of the boys is adorable! Glad you've found a good way to handle those springtime allergies. They can be so miserable, but the side effects of the meds can feel WORSE! I fortunately don't have allergies but I really feel for those that do. Poor little guys. We have plenty of allergies here too. Confusing for sure. I'm sorry your little ones are fighting allergies! I love the photo of the twins. I hope the Claritan brings the kids relief. I have had allergies all my life, and I grew up on a farm. I lived in the middle of hayfields, I like to say. As an adult, I was diagnosed with asthma. I probably always had it, it just went undiagnosed. Taking Zyrtec helps keep the worst allergy symptoms at bay, which in turn helps the asthma. My husband suffers too. He takes Claritan and has good results. My allergies are off the charts. It's no fun! My 6 year old's eye was all swollen. I got him to use the netti pot. It really helped!